I thought you might be interested in Danny Herrera of the Reds. He has only pitched twice, June 3rd and 11th, but he is a left-hander with a screwball, which is a rare pitch. Neyer argues that the screwball has been largely supplanted by the split-finger fastball and the circle change-up, both pitches that are easier to throw and useful against opposite-handed batters. Daniel Herrera, acquired by the Reds along with Edinson Volquez for Josh Hamilton over the offseason, was called up to the majors on June 3 when Kent Mercker went on the disabled list. He pitched in one game on June 3 but was sent back down to Triple-A Louisville when Homer Bailey was recalled on June 5. When Gary Majewski was placed on the bereavement list on June 10, Herrera was called back to the big league club, pitching in his second game on June 11. He was sent down again on June 14 before getting a third trip to the mound. 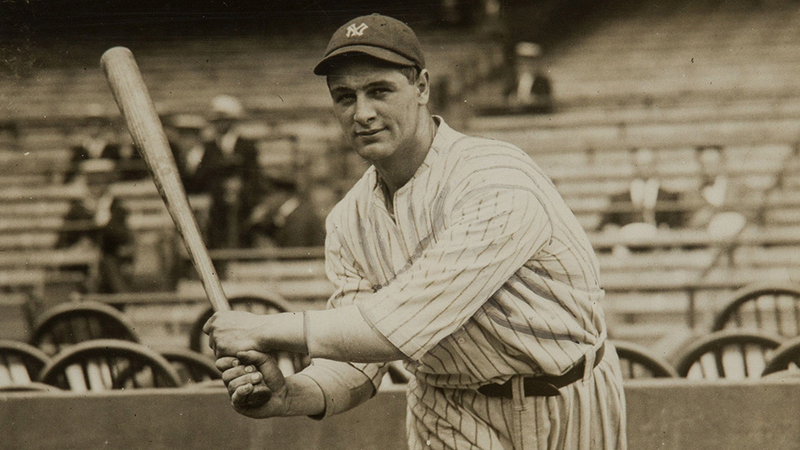 His first appearance was more successful than his second, but his screwball was on display in both outings. What is the screwball? Simply put, it’s a curveball that breaks the other way. When the pitcher releases the curveball, instead of twisting his wrist out away from his body, he twists it in toward his body. This puts spin on the ball in the opposite direction and makes the screwball from a left-handed pitcher break down and away from a right-handed batter instead of breaking down and in like the curveball. Herrera’s slow pitch is sometimes referred to as a screwball and sometimes as a change-up. The two pitches do have similarities, but the wrist rotation that produces topspin on the ball is a signature of the screwgy. I don’t claim to be an expert on pitching mechanics and grips, so I’ll turn to Will Kimmey’s description from a 2006 Baseball America article on Herrera. Herrera, D-Ray to anyone who knows him, started experimenting with his grips on a circle changeup. He twists his wrist outward (like a screwball) when he releases the pitch and grips it with his index finger off the ball, guiding it with his middle finger. He changes the position and pressure of his ring finger and pinky to vary the movement either down or away from right-handers. The changeup trickles to the plate at about 65 mph. 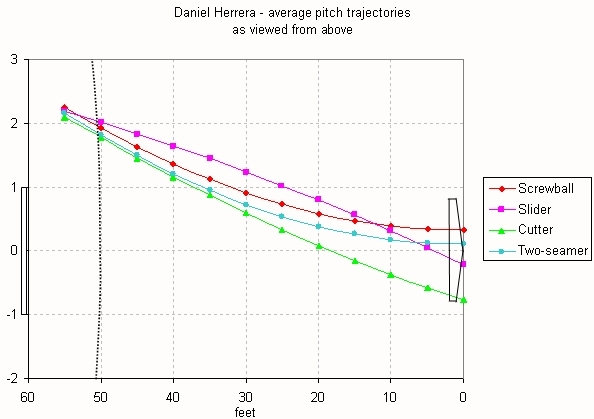 How does Herrera’s screwball/change-up pitch move, and what is the rest of his repertoire? At press time, he had appeared in only two games, throwing 63 pitches. Given his recent history with the Reds, he may have already been called back up by the time you read this, but his first two games were enough to get an idea of what he throws. I throw a two-seam fastball and a cutter. I hardly ever throw any regular four-seam fastballs. I like my fastballs to be able to run in and off the plate. My slider is pretty good. It moves pretty well and it’s kind of fast, so I get some pretty good movement on that. I have good location most of the time. My change-up is my money pitch. It’s more like a screwball. It breaks about 12-to-6 and it’s about 60 to 65 miles per hour, so it’s a big difference from my fastball. I get some really good arm action with it and it helps out a lot. 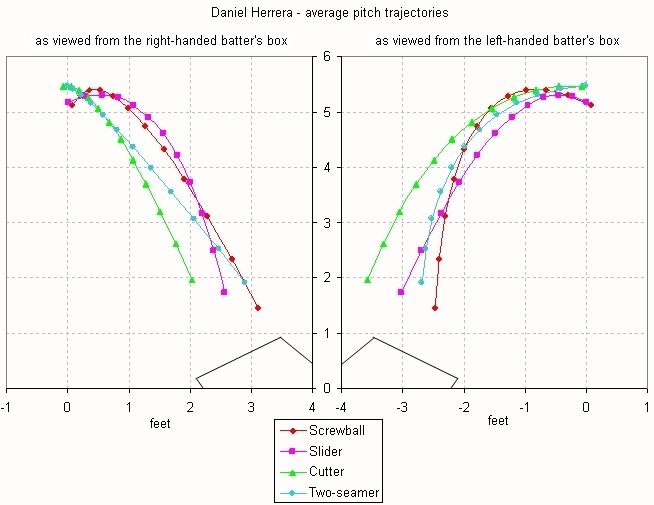 When I look at the PITCH f/x data for Herrera from his first two appearances, I also see a two-seam fastball, a cut fastball, a slider, and a screwball. Let me include a couple charts that show how his pitches move. The first chart is my traditional chart for demonstrating a pitcher’s repertoire. 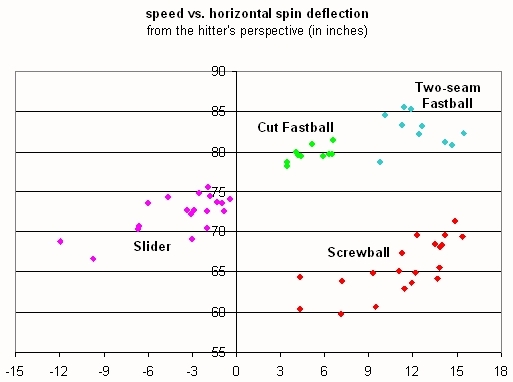 It graphs the speed of the pitch versus the angle at which the spin is causing the ball to break. 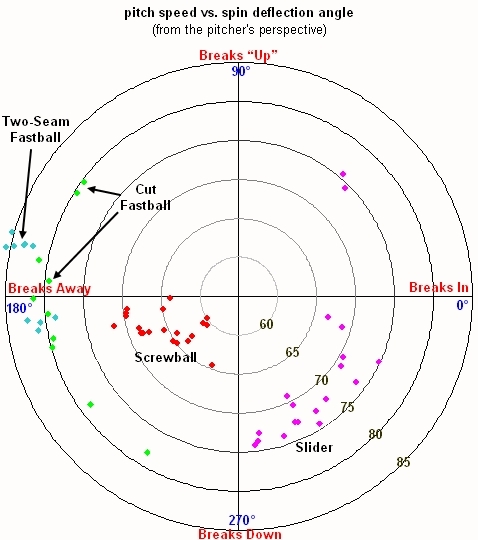 It’s a good graph for showing that he is indeed getting some topspin on his screwball, but it’s a bit tough to understand what’s going on with his other pitches or to see why I grouped them the way I did. His cutter is mostly spinning around the direction of travel (i.e., it has a small x-z component of the spin rate, for the other PITCHf/x analysts out there), so it doesn’t break away from a right-handed hitter as much as his two-seamer. To show that effect, here’s a chart of the speed and horizontal spin movement on the pitches, as seen from the catcher’s view. He throws fastballs about one third of the time, another third sliders, and screwballs make up the final third of his repertoire. His fastballs are split evenly between an 83-mph two-seamer and an 80-mph cutter. A few of his sliders have some curveball characteristics, but overall the break and speed (70-75 mph) are more consistent with a slider label. Since everyone else, including Herrera, calls them sliders, I’ll do that, too. His screwball spins to the plate in the 60-70 mph range. Next, let’s look at some pitch trajectories, building on ideas pioneered by other analysts (see the References section for details). 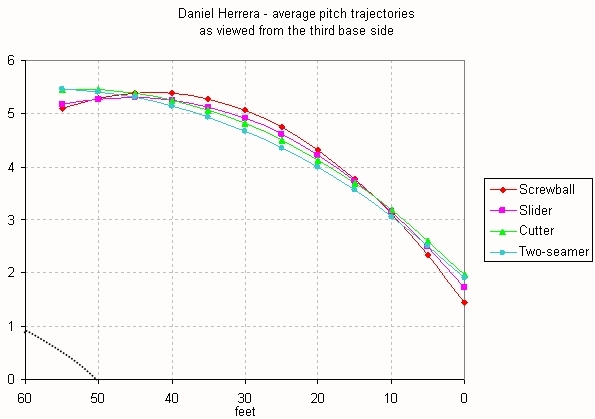 I took the average pitch trajectory for each of Herrera’s four types of pitches and plotted those average trajectories from several different viewpoints. First, here’s the view from the third base side. I’ve compressed the distance between the mound and home plate and expanded the vertical axis, or else all the pitches would look the same. You can see that he releases his breaking pitches about four inches lower than his fastballs, on average. The screwball has a bit of a hump, going slightly higher than the other pitches before ending up around the batter’s knees. Now, let’s look at the movement of his pitches from overhead. 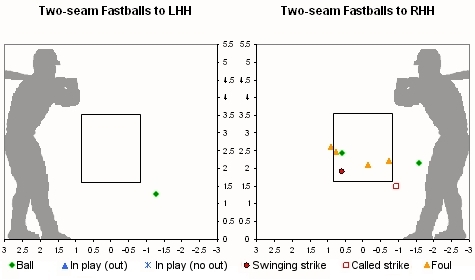 Here you can see the difference between his two fastballs. The cut fastball has very little spin deflection and stays straight on course for the inside edge against a right hander while the two-seam fastball tails away from the right-handed hitter. You can also see the reverse curve of the screwball, which breaks in the opposite direction from the slider. A third interesting viewpoint for pitches is from home plate looking out toward the pitcher’s mound. Typically, the catcher and umpire’s view has been shown, as reflected in the PITCHf/x coordinate system with its origin anchored at the tip of home plate. This is what I initially set out to do. But as I thought about the screwball and how it would look to right-handed and left-handed batters, I got an idea. Why not present the view from each batter’s box? Would the movement look very different from a vantage point just a few feet away? It would require a coordinate system transformation, which was one of my favorite topics in my long-ago classical dynamics class in college. Well, it was worth a try. See what you think. The fastballs look almost straight to the right-handed hitter, and the breaking pitches have a noticeable hump; however, all the pitches appear to bend more sharply to the left-handed hitter, and the trajectories overlap more. If all left-handed pitchers’ repertoires look somewhat like this, no wonder left-handed batters have a harder time with them than right-handed batters. It makes me eager to apply this technique to other pitchers. 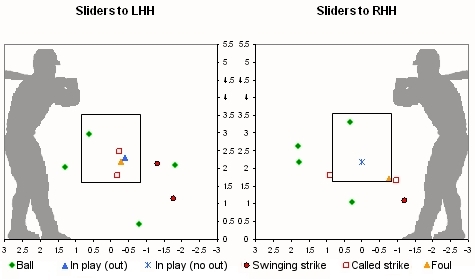 How has Herrera used these four pitches in his three-plus innings of work so far? Let’s take a look at the location charts and results split out by pitch type and batter handedness. He threw only one two-seam fastball to a left hander. To right handers, he’s gotten pretty good results around the lower half of the zone, generating several foul balls. Of course, this is a really small sample, so there’s no point in drawing too many conclusions. 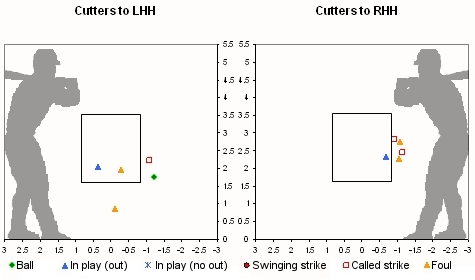 Herrera did a great job of locating cut fastballs on the inside black to right-handed hitters, and keeping the ball down to left-handed hitters, inducing groundball outs from Troy Glaus and Rick Ankiel. The called strike farthest inside was strike three to Pat Burrell, a fact Burrell was none too happy about. He was all over the place with his slider location, throwing eight balls in 19 pitches. He also got three swings and misses on sliders off the plate, including a key pitch to strike out Ryan Howard with the bases loaded. He mostly spotted his screwball down out of the zone, and he got right-handed hitters to chase that pitch, generating several foul balls, including a second-deck shot by Pat Burrell that was pulled well foul down the left-field line. When he got the screwball up in the zone, he didn’t do as well, surrendering a single to left field to Jason LaRue, a sharp groundball double down the left field line to Braden Looper (who, although a pitcher, is a .247 hitter in 89 career at-bats), and a home run to Ryan Ludwick. 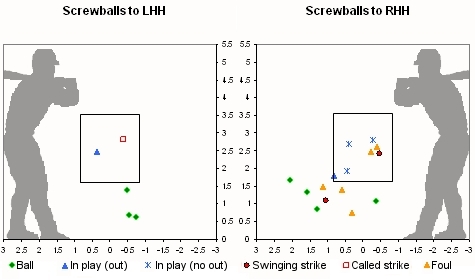 It was interesting to find that a screwballer is back in the majors again and to have the opportunity to examine his pitches through the lens of PITCH f/x. Pitching is fascinating, and rare pitches like the screwball just make it more so. I wish Danny Herrera the best in his career and hope to have a mountain of screwball data to examine at some future point. The pitch trajectory views I presented are inspired by or copied from previous work by Dan Fox and Harry Pavlidis as well as a number of good articles recently written by Josh Kalk. In order to produce the views from the batters’ boxes, I shifted the view over by 2.8 feet in each direction, rotated the coordinate system so that y-axis ran on a line between the batter and the pitcher’s release point, and applied trigonometry to recalculate new x-coordinates.